A source from the Apple Store said if the latest generation iPad users will be launched on March 16, 2012. So what happen on March 7th? March 7, 2012 will be the date when Apple iPad 3 (iPad HD) introductory event be held in United States. Nine days after the event, iPad HD will enter the market and already available to purchase. "It's common, iPad 3 will be launched on Friday, or about 9 days after the announcement of its presence (on March 7)," said the source was quoted by 9to5Mac. Because of the enthusiasm of the buyers, several Apple stores in London and Houston are busy preparing to welcome the Apple's latest device, iPad 3. Apple's tradition is always like that. We can look back the release of iPad 2 in 2011. 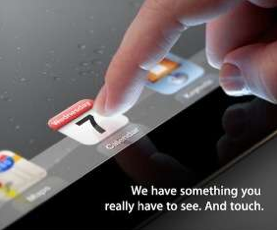 At that time, iPad 2 exhibited officially on March 2, only 9 days before the launch on March 11. This latest generation of iPad will be greatly anticipated by the fans. The iPad HD will feature retinal-tech screen display with a 1080p high definition (HD) resolution.